It's the middle of July so that means it's time for the annual rain dance that is the RHS Tatton Flower Show, the yearly jaunt for the chattering horticultural classes of Cheshire. Last year's showing was pretty bloody poor, mainly due to greater than normal incompetence forcing the so-called press to share access to the site with the swarms of ladies-that-lunch and husbands-that-follow-in-cardies, which resulted, completely predictably, in the event being damned with faint praise by many publications far more erudite than this website. Thankfully, that farcical situation has been abandoned for 2012, and members of the press are afforded access one day before the masses descend, but looking in at the Press Tent around 10:30am, and talking to several exhibitors, you begin to appreciate some of the reasoning that must have crossed the minds of the organisers last year. There was me, armed with a soggy notebook and compact camera, plus two other "proper" journalists. 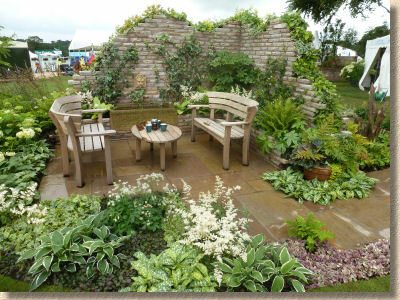 There was no mad scramble for space, nor was there much of a struggle to collect the sparse press release info, the brochures and stapled sheets that let you know why such-and-such a garden is a must see. It was all a bit underwhelming. I suspect that putting out a press release a good fortnight before the event declaring that the rain won't deter the valiant exhibitors is somewhat self-defeating. It's a sort of admission that it's going to bloody persist down, but please turn up anyway. Oh dear! I've been to every Tatton since the RHS deigned to put on a show in the badlands of North West England, and it always has the most ambivalent effect on me. One second I'm in despair at the pathetic lack of support from the big names who lavish cash on ludicrous creations at Chelsea and Hampton Court, and then my spirit soars when I see a work of inspired genius from a primary school from inner-city Birkenhead. I weep at the appallingly poor coverage it gets from the national press (unless we get a dry day and there's a photo-op of some Trophy Wives in their glad rags and their assets on display) but then I talk to the lads who do the Flower Bed displays and revel in their sheer enthusiasm. There's something very northern, or more particularly, something very Mancunian about it, the "we don't give a toss about anyone else, we thinks it's great" attitude that gave us The Guardian, The Hacienda, and the Co-operative movement. The Show Gardens aren't as grand as those London Shows, but there is much greater variety. 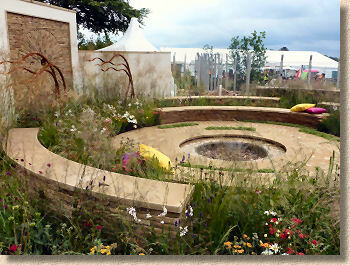 You get a sense that some of these gardens are here to win work for the designer and contractors, but some are here to make a statement, whether it's celebratory, such as the stunning Mornflake garden, or political, as in the case of the Q-CAT presentation. There are opportunities for young designers and for established contractors, for charities, for local councils, for colleges, for dreamers, and, it has to be said, for loopy nut-jobs. 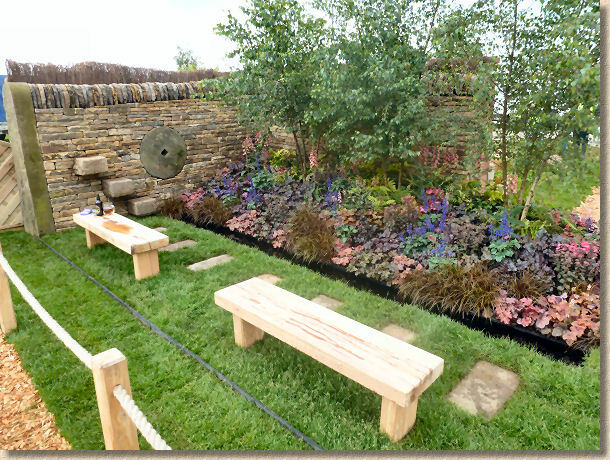 I normally comment on most of the gardens, offering my overly cynical and acerbic views, but this year, I think it might be more useful to reflect on themes and common threads that can be observed at the show. The sheer variety of garden has already been mentioned and I genuinely believe that, northern pride aside, there is a far greater expanse of inventiveness and creativity at Tatton than at any other RHS Show. However, the implementation sometimes fails to live up to its potential. If you must lay stack bond pattern, getting the setts aligned is essential Some of the paving on show is laid to a pretty bloody poor standard. 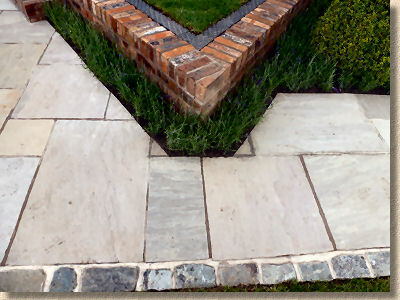 Plenty of curved paths cut from flagstones, but nearly all of them have obviously been constructed by laying full flags then cutting out the desired shape with absolutely no concern if it results in tiny triangular pieces clinging to the edge of the path. This is BAD practice. More than that; it's WRONG! But I saw only two gardens where an effort had been made to avoid this, and even then, it was a token effort with sections reverting to type. 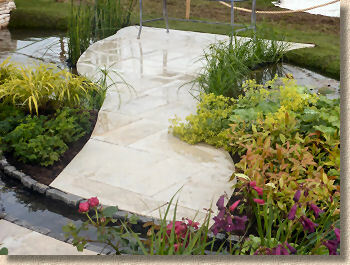 If we have so-called Show Gardens, claiming to be the cream of garden design, yet the paving installation is wrong, faulty, sub-standard, crap, call it what you will, then how can we ever expect the trade in general to improve standards? Some white-van contractor will now be telling a concerned client that those crappy cuts and finicky triangular bits are fine, because that's how they did it at Tatton. If the planting was wrong, if roots were exposed at the surface or trees were leaning over, the garden would be marked down, but poor paving slips through the net. It can be done. 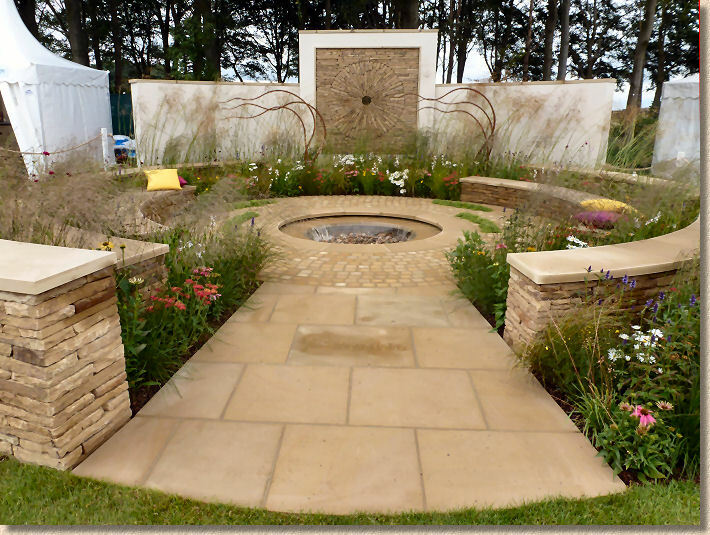 The one stand-out effort, and it stood out by quite some way, is The Mornflake Garden where natural stone has been precision cut (probably offsite) and then laid to a fantastic standard of accuracy. 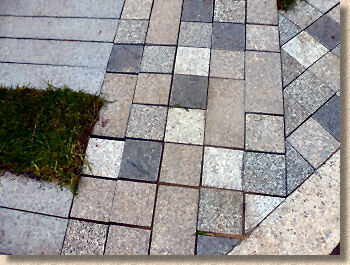 Joints that are parallel and minimal; setts laid to perfect arcs, falls detectable but not excessive; no standing water. I don't know the contractor personally, but they deserve a big slice of the well-deserved Gold Medal and Best In Show Award because their work is exemplary. 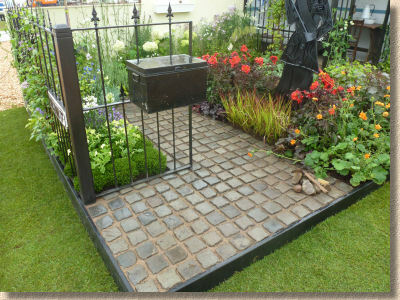 Brett Paving had provided hard-landscaping materials to at least three gardens, with varying degrees of success. The triple-faceted design by Southport's Muddy Boot's was by far the best, but there are problems with the cutting of paving (see above) and I thought the mortar colour was too similar to that of the walling stone, and more of a contrast would have emphasised the natural origin and the high quality workmanship to a greater degree. The Travertine on the Remount Garden is just wrong. I have a well-documented dislike for Travertine, and seeing it in these damp, soggy conditions, complete with bootprints and suspicious-looking levels does nothing at all to persuade me to re-think my opinion. And the Diamond Garden screamed at me by being so keenly focussed on a single point, where the walling, the mowing strips and the paving all meet at a single apex, and NONE of it is mitred, but is crudely sawn to fit! Ow!! Layout of Indian sandstone isn't balanced. 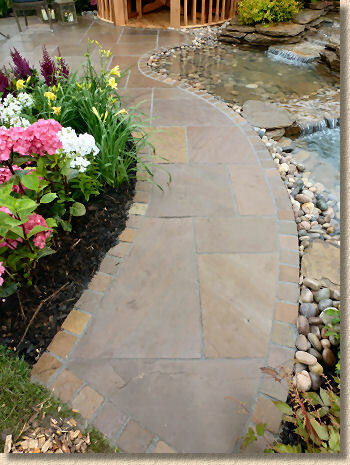 Natural Paving have provided a generous quantity of their limestone/marble paving, and tumbled walling, for the Modern Romantic Garden, and it immediately prompted a 'compare and contrast' exercise with the Travertine mentioned previously. Both types of stone are essentially a baked limestone, yet one looks stunningly good and right and proper (despite issues with the cutting) and the other looks awkward and uncomfortable and misplaced. How this won only a Bronze defeats me. There must be something in the planting that I am incapable of spotting, but I'd much sooner see this from my window than some of the efforts that were given higher awards. ...but that cutting to the edge is dodgy! On the subject of medals, I want to mention just one of the "Orchestra Gardens", which you may be surprised to learn are small-ish gardens based on an orchestral theme. 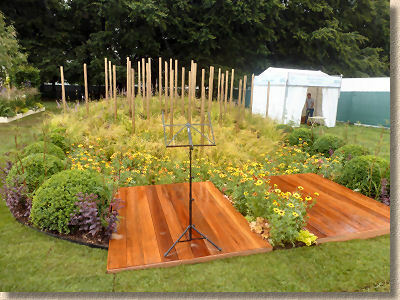 Brass, a garden by Alan Gardner, is essentially a planted mound with a series of brass effect pipe projecting skywards. No paving to speak of, but the garden was dedicated to an old friend, the garden designer Ann Picot, who passed on earlier this year. She will no doubt be furiously plucking at that harp in celebration of the Gold Medal awarded to the garden. Ann was a regular at Tatton, always inventive, always enthused, always chatty. We worked together on the Spaced Out project some years ago, and we were fellow judges at the UK Skills Competition back in 2008. Her warm smile and dizzy glee helped me through a very wet and very cold three days in January. Ann: you'll be missed. 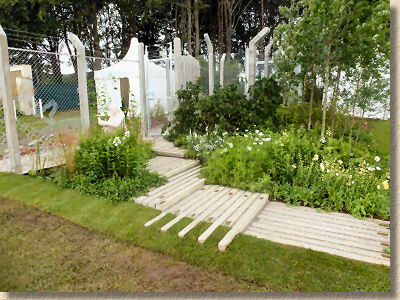 And on the subject of the UK Skills, the next level of competition, the World Skills Challenge, was taking place just a few metres from the garden dedicated to Ann. I spent 20 minutes or so watching the young apprentices build four gardens. They don't half like laser levels! There was an almost non-stop beeping as every spadeful of soil and every plant had its level checked. What they don't seem to like is proper paving skills. Coursed shallow setts being laid freehand, then hammered down by placing a spirit level across the top and hitting it with a mallet! Jaysus! I'd have had a crowbar inserted up the rear if my tutor saw me doing that when I served me time! 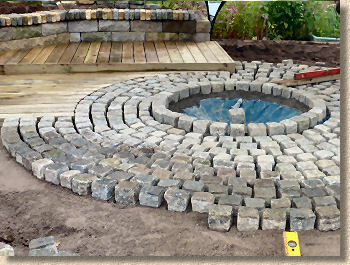 Radial reclaimed granite setts being laid with joints wide enough to snap an ankle and no central measure to ensure alignment accuracy, and no sorting of setts to present the best head. Indian sandstone flags laid on beds offering only partial support, with great voids visible beneath the flags. Use a measure to ceck the circles are accurate, not guesses! I appreciate that the so-called skill is 'Horticulture' rather than 'Streemasonry', but as the person responsible for writing the paving modules for the Amenity Horticulture NVQ, I do expect the apprentices to have learned something from all my efforts. If this is the future of the paving trade, Gawd help us! After 3 hours of trudging around the soggy site, the near constant drizzle had managed to find its way through the several protective layers I had chosen to wear, and was beginning to trickle down to the gusset of the undies, and as far as I'm concerned, that's the signal for it being time to go home. Back to the car and head west. I swear to you this is absolutely true: approximately one mile due west of Tatton Park lies the parish of High Legh, where the sun was out, the roads were bone dry, and the world seemed a better place. Typical! So what do we take from Tatton 2012? 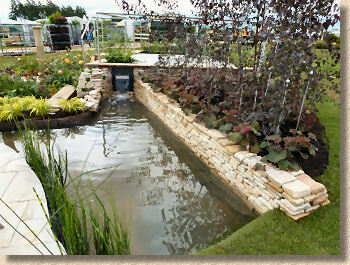 You get to see a greater variety of gardens than at any other show, and the inclusiveness is its strongest asset. Local councils, schools, young designers, colleges, apprentices and small, local designers all get a chance to shine. 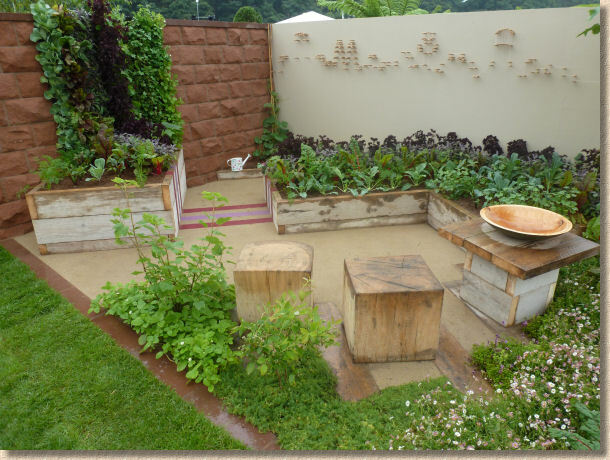 This truly is a celebration of gardening in the truest sense of the word. It's not about how much is spent, or how cutting-edge is a garden; it's about the creativity of regular people who love gardening. 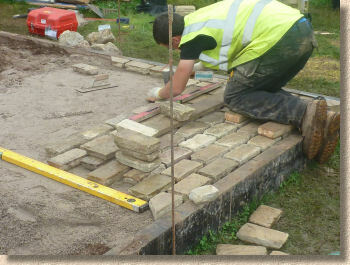 Props, as the kids like to say, to Brett and Natural Paving for helping out with some of the bigger gardens, and to Marshalls for chucking in for the World Skills Challenge. There are plenty of smaller suppliers, too, far too many to mention, but their efforts are appreciated. It's good to see these businesses supporting garden construction without feeling the need to be in-yer-face with marketing and branding. Now that's how stack bond should be laid! The provision of press access without needing to fight off the general public is a return to common sense by the RHS, but I do wish there was less of the 'my camera is bigger than yours so move out of me way'. 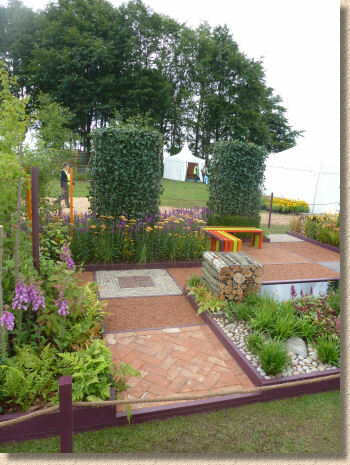 I was trying to admire the Reaseheath Garden, Nature Squared (Silver Gilt Medal), when I was told to bugger off because some git with a several-thousand-quid camera and tripod was setting up a shot. It *is* possible to correctly cut curving paths, if you try! And I wish the exhibitors would be more forthcoming. Some of them give the impression that they really don't want to talk to you unless you are from the local telly. It's us writing about the shows that provide exhibitors with the essential oxygen of publicity. Please don't treat us as an inconvenience: we are your route to a wider audience. 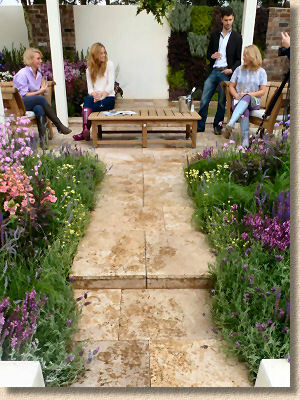 I am genuinely looking forward to Tatton 2013. I have suspicion that, after I've-lost-count-of-how-many years of drizzle, we are long overdue a real scorchio summer for the show. Just imagine, walking around Tatton in shoes rather than wellies, and no coat. Oh, the joy!